This dog carries two copies of D which does not result in the "dilution" or lightening of the black and yellow/red pigments that produce the dog’s coat color. The base coat color of this dog will be primarily determined by the E, K, A, and B genes. The dog will pass on D to 100% of its offspring. This dog carries one copy of D and one copy of d which does not result in the "dilution" or lightening of the black and yellow/red pigments that produce the dog’s coat color. The base coat color of this dog will be primarily determined by the E, K, A, and B genes. The dog will pass on D to 50% of its offspring and d to 50% of its offspring. This dog carries two copies of d which results in the "dilution" or lightening of the black and yellow/red pigments that produce the dog’s coat color. However, this variant modifies or "dilutes" the base coat color of the dog that is primarily determined by the E, K, A, and B genes. The dog will pass on d to 100% of its offspring. The D Locus (Dilute) corresponds to a region of the MLPH gene that is important in determining coat color in dogs. This gene variant modifies the expression of the pigments, eumelanin and phaeomelanin in the hair. A genetic variant within this gene results in a “diluting” or lightening of the coat color of dogs. Canine coat color determination is complex due to interactions of multiple genes responsible for both color and anatomic placement of the color. A dog with two variant copies of the MLPH gene will have a blue, charcoal, Isabella (lilac) or fawn coat color depending on the other coat color genes present in the individual. Disease Association Note: Variants of the D locus are sometimes responsible for a condition called color dilution Alopecia, black hair follicular dysplasia, or blue Doberman syndrome (depending on the breed) because dilute coat color can be associated with development of alopecia (hair loss). The clinical presentation of alopecia associated with dilute coat color is variable within and between breeds; therefore only a portion of individuals carrying two copies of the MLPH gene variant will show hair loss with some breeds being much more likely to develop the condition. Though two copies of the MLPH gene variant are necessary to develop color dilution alopecia, the variable presentation of this condition suggests that additional environmental or genetic factors contribute to the development of alopecia. Dogs affected with alopecia typically present with loss of hair between the ages of four months and two years. Hair of affected dogs can also appear dry and dull. The hair loss is caused by abnormal Melanin storage in the hair, which leads to breakage of the hair shaft and the lack of normal regrowth of hair. Dogs with this condition can also be affected with recurrent bacterial skin infections originating in the hair follicles (folliculitis). Given that the modifying environmental or genetic factors responsible for alopecia are unknown, the only way to prevent color dilution alopecia is to avoid transmitting the dilute coat color variant to offspring in susceptible breeds. Genetic testing of the MLPH gene will reliably determine the number of copies of the color dilution gene variant that a dog carries. Coat color dilution associated with this particular MLPH variant is known to be inherited in an Autosomal Recessive manner in dogs. Carrier dogs do not display a dilute color and are not at risk for Alopecia but when bred with another dog that also is a carrier of the same variant, there is a 25% chance of having pups with diluted coat color that may also be susceptible to alopecia in some breeds. Reliable genetic testing is important for determining breeding practices. Dogs that are not carriers of this variant have no increased chance of having pups with diluted coat color or alopecia. *Note: Normal results do not exclude inherited mutations not tested in these or other genes that may also contribute to coat colors and traits in dogs. Coat Color Dilution in Dogs. Institute of Genetics. University of Bern, 02 May 2007. Web. 02 Apr. 2014. <http://www.genetics.unibe.ch/content/rubrik/dilute/index_eng.html>. Colour Dilution Alopecia. Colour Dilution Alopecia. Sir James Dunn Animal Welfare Centre and the Canadian Veterinary Medical Association, 02 Feb. 2004. Web. 03 Apr. 2014. <http://www.upei.ca/~cidd/Diseases/dermatology/colour%2520dilution%2520alopecia.htm>. Schmutz, Sheila. "Conditions Associated with Coat Color in Dogs." University of Saskatchewan. University of Saskatchewan, 02 June 2011. Web. 03 Apr. 2014. <https://homepage.usask.ca/~schmutz/dogconditions.html>. Scott DW, Miller WH, and Griffin CE. Mueller and Kirk’s Small Animal Dermatology, 7th ed. (2013). pp 593-597. WB Saunders, Philadelphia. Yousha, JP, D Bannasch, and Phyllis McDonald. 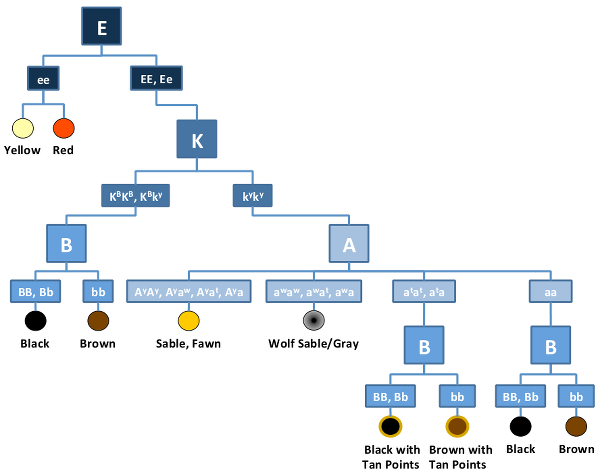 "Coat color in the toller: Breed history and current genetics." Nova Scotia Duck Tolling Retriever Club. Web. 1 Apr 2014. <http://nsdtrc-usa.org/wp-content/uploads/2013/12/COAT-COLOR-IN-THE-TOLLER.pdf>.